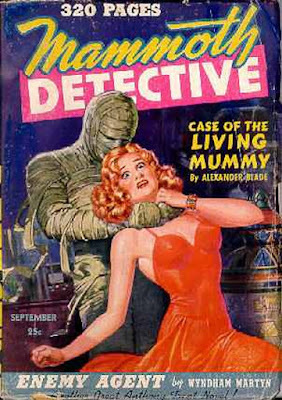 I'm sure there are people who collect mummy covers. This is a pretty good one. And with stories by William P. McGivern, Howard Browne, Dwight V. Swain, Robert Leslie Bellem, G.T. Fleming-Roberts, George Armin Shaftel, the ubiquitous Alexander Blade, and more, this issue of MAMMOTH DETECTIVE is probably pretty good reading, too. WESTERN ADVENTURES may have been Street & Smith's third-string Western pulp (behind WESTERN STORY and WILD WEST WEEKLY), but it had some excellent authors in its pages. 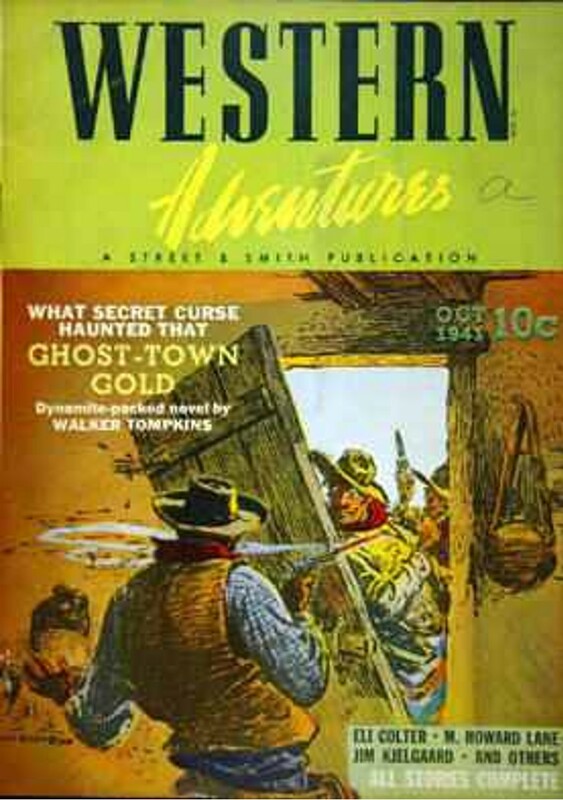 This issue featured stories by Walker A. Tompkins, Norman A. Fox, Jim Kjelgaard, Eli Colter, Ney N. Geer, and M. Howard Lane. I'm fudging a little this week since "Night Calls the Green Falcon" is a novella, not a novel, but it's been my favorite of Robert McCammon's work since I first read it 25 years ago, it's available by itself as an e-book, and when I reread it recently, it held up very well. So I thought I might as well say a few words about it and maybe inspire some of you to read it. 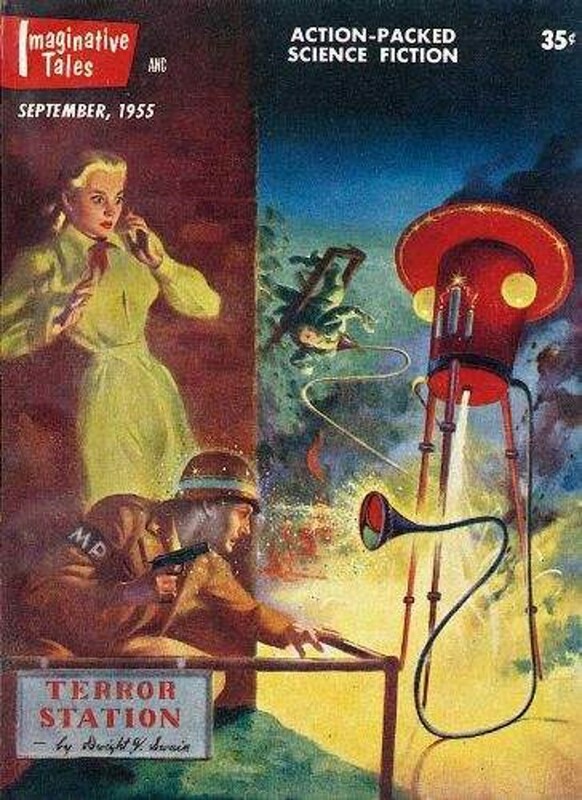 "Night Calls the Green Falcon" was first published in 1988 in the anthology SILVER SCREAM, edited by David J. Schow. 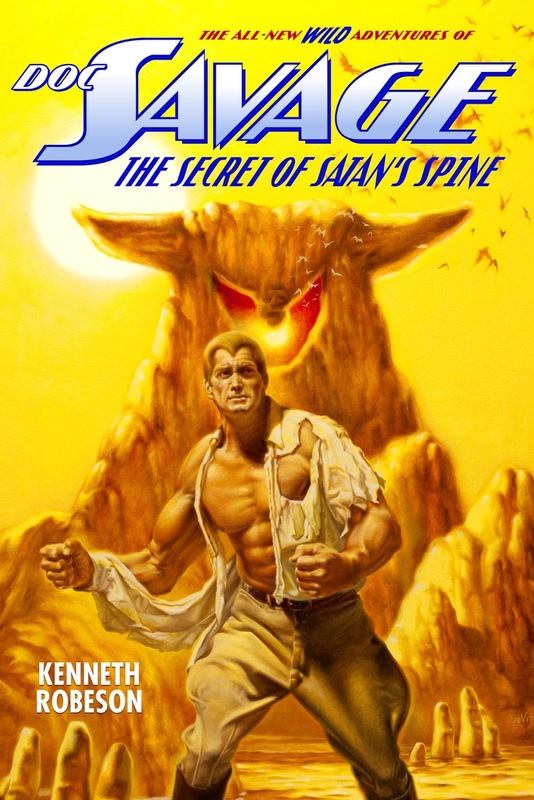 I had a copy of that book but never got around to reading it. 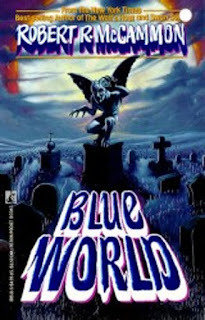 I did, however, read this story when it came out a couple of years later in McCammon's collection BLUE WORLD. That's a great collection, but "Night Calls the Green Falcon" is the real stand-out as far as I'm concerned. 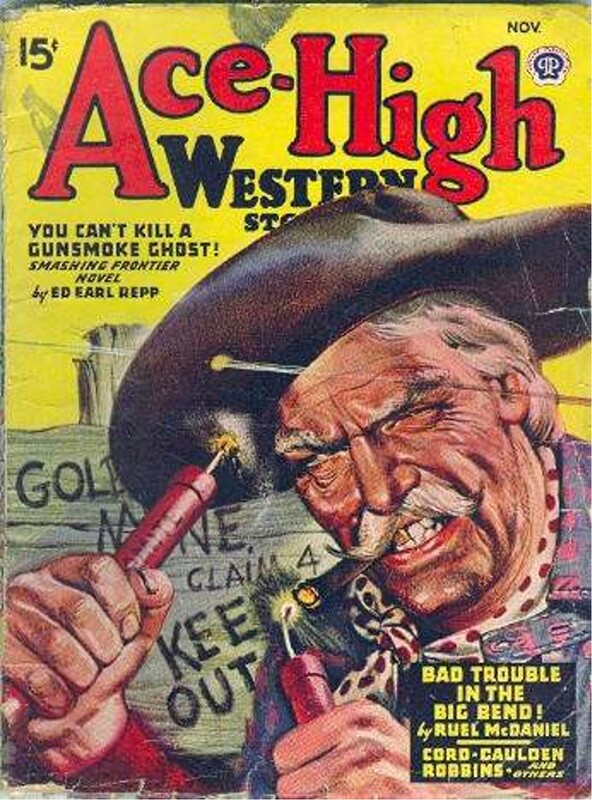 Creighton Flint (real name Creighton Boomershine) is a washed-up actor, a former champion athlete from the Midwest who went to Hollywood in the early Fifties and starred in four movie serials during the fading days of that film genre, until a tragedy cut short his career. He played the masked crimefighter known as the Green Falcon and still has the costume from those serials, even though it's not in very good shape. Neither is Flint, who now lives in a rundown apartment house in a bad neighborhood in Hollywood. A serial murderer known in the papers as the Flip-Top Killer has been preying on street people in the neighborhood, and when a friend of Flint becomes one of the victims, he sets out to track down the murderer. But he puts on the uniform of the Green Falcon to do so, which attracts unwanted attention and complicates Flint's quest for justice—which is also a quest to reclaim his lost celluloid heroism. Things play out about like you'd expect in this novella, and McCammon opens it with a dream scene, a technique I don't like, but other than that it's very well written and the pace is absolutely relentless. More than that, and most of all, it's an unabashed love letter to serials, comic books, pulps, and all the other things that helped make so many of us what we are today, and I don't mind admitting I was a little misty-eyed when I got to the end. To quote a wise man from Alvin, Texas, I miss the old days, and I sort of miss 'em even more after reading "Night Calls the Green Falcon". McCammon's a fine writer and I still have several of his books that I haven't read yet, but I doubt if any of them will top this one for me. 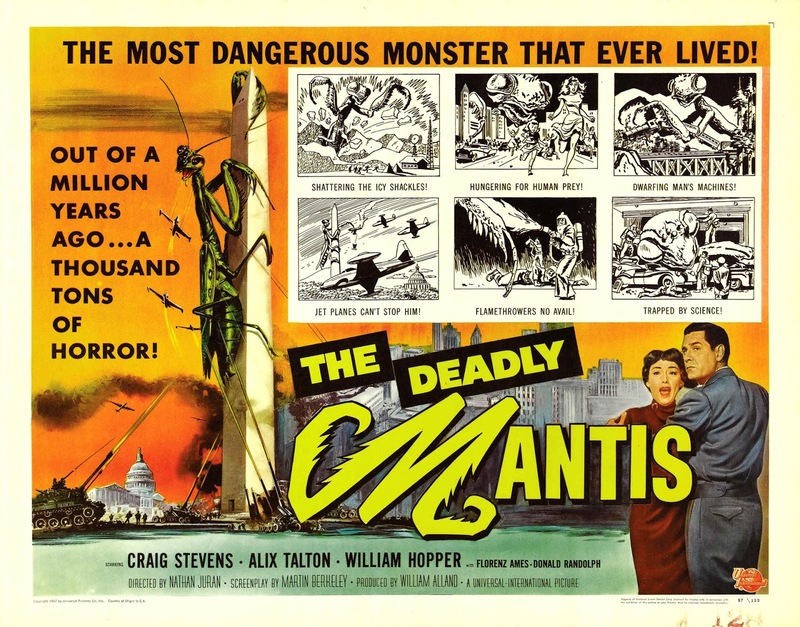 Here's another one from Svengoolie that I missed somehow growing up. 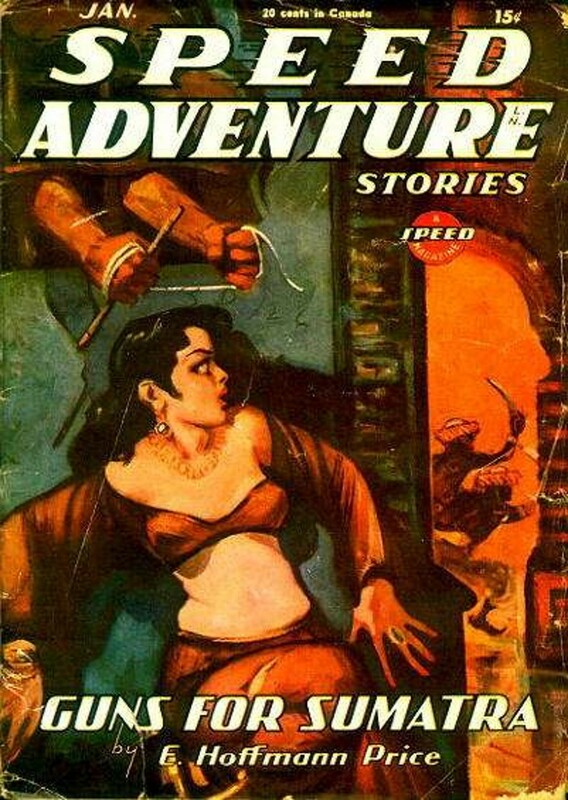 TARANTULA is a pretty good entry from the giant creature genre. Nuclear biologist Leo G. Carroll (best known as either Cosmo Topper or Alexander Waverly, depending on your age, I guess; I remember him as both of them) is working on a formula that will solve the world's hunger problem. Unfortunately it has a couple of side effects: it makes animals grow incredibly big, and it turns human subjects into acromegalic freaks. 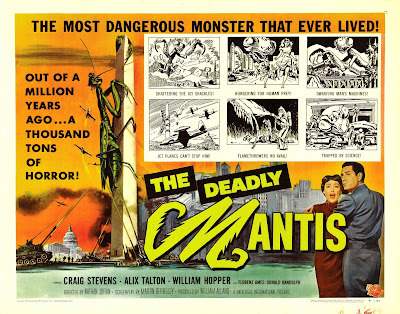 Naturally, one of the test subjects is a tarantula that gets loose, grows to 100 times its normal size, and terrorizes the nearby desert community. 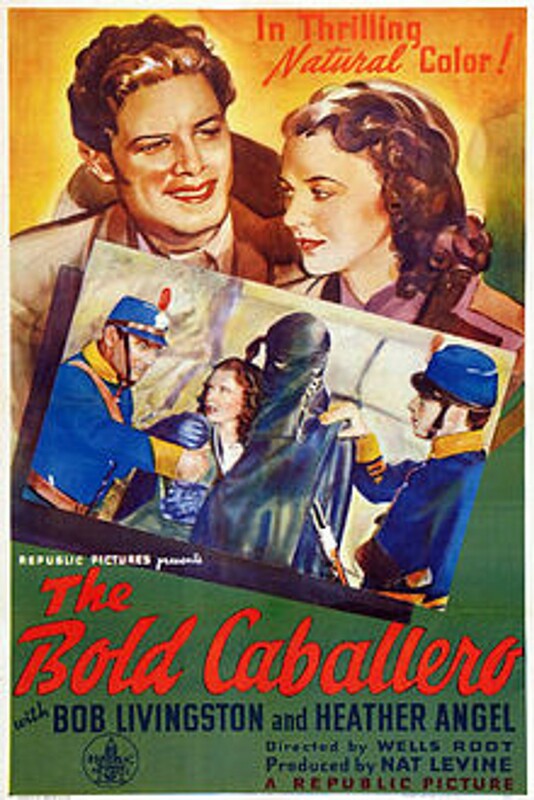 John Agar is the local doctor (when I was a kid I had a good friend who was a huge John Agar fan), Mara Corday is a gorgeous graduate student, Raymond Bailey (Milburn Drysdale from THE BEVERLY HILLBILLIES) is another scientist, and a very young Clint Eastwood is a fighter pilot who has three or four lines and is on-screen maybe 30 seconds. 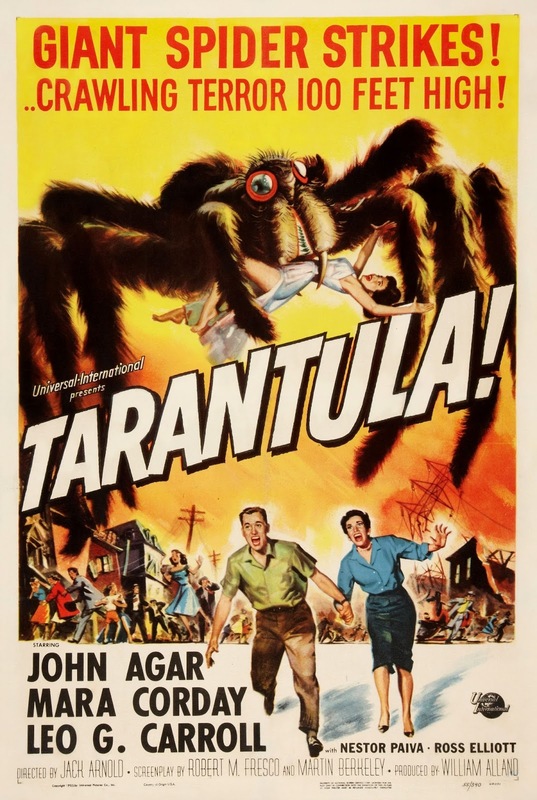 Despite the occasional lapse of logic in the screenplay, TARANTULA is a well-made film directed by Jack Arnold and watching it was a considerable amount of fun. 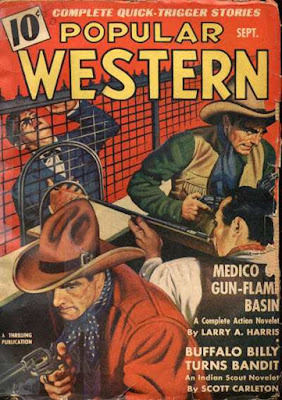 One thing struck me, though, during the opening scene where one of the human victims of the formula dies in the desert (a pretty effective opening, by the way): a lot of these movies were shot in the same locations where many Western movies were made. 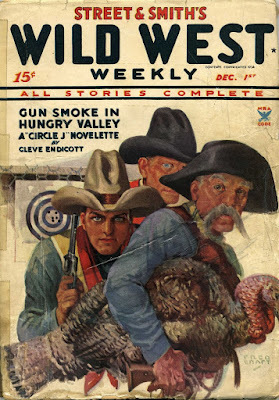 Then later, during the town scenes where there are lots of guys in cowboy hats walking around, the thought crystalized. They should have made one of these giant creature movies with Roy Rogers. Just imagine Roy, backed up by Andy Devine, Foy Willing, and the Riders of the Purple Sage (since it's the Fifties and Gabby Hayes and the Sons of the Pioneers have moved on by then) fighting some giant grasshopper or such, in a movie directed by William Witney and written by Sloan Nibley. I'd watch that! 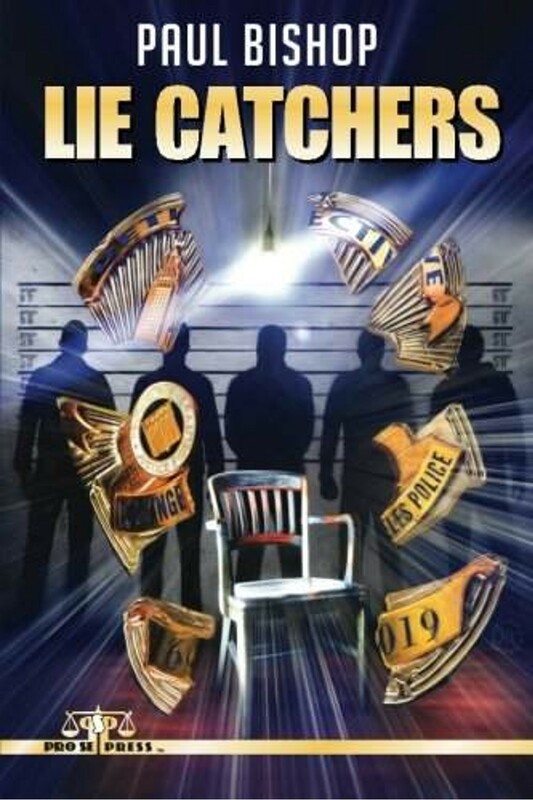 Paul Bishop has been one of my favorite writers for a long time, but he may have set a new standard for himself with his latest novel, LIE CATCHERS. This is the first book in a new series featuring LAPD detectives Ray Pagan and "Calamity" Jane Randall, who is also the narrator. Both of them have special abilities that make them better at what they do—interrogating prisoners—than anybody else. 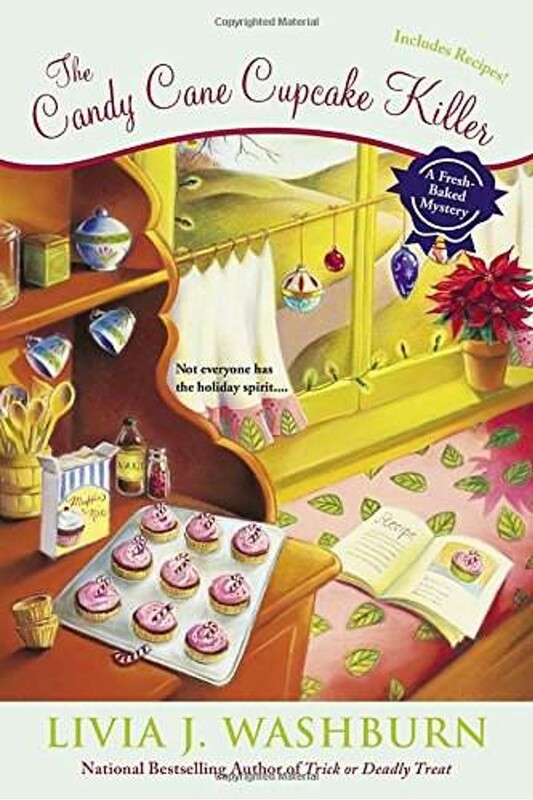 As LIE CATCHERS opens, Randall is recuperating from a gunshot wound suffered in the line of duty, during an incident that's one of several which have given her the nickname "Calamity". She wants to get back to work but is uncertain about being teamed with the eccentric Pagan, who doesn't really dress, talk, or act like any of the other cops she has known or worked with. It doesn't take her long to figure that he's a genius at interrogation, though, and he thinks she can be, too. After working together on a gang shooting case, the new team launches into the investigation that will keep them busy for the rest of the book: the kidnapping of the six-year-old daughter of a rap music mogul. Before long there's the seemingly unrelated kidnapping of another child and a couple of murders to complicate things, but Pagan and Randall sort through everything with a mixture of dogged police work and brilliant questioning of suspects. The police procedural element is fascinating, as is the developing relationship between the two protagonists. Bishop's prose races right along, never losing control of the complex plot. LIE CATCHERS is easily one of the best novels I've read this year. 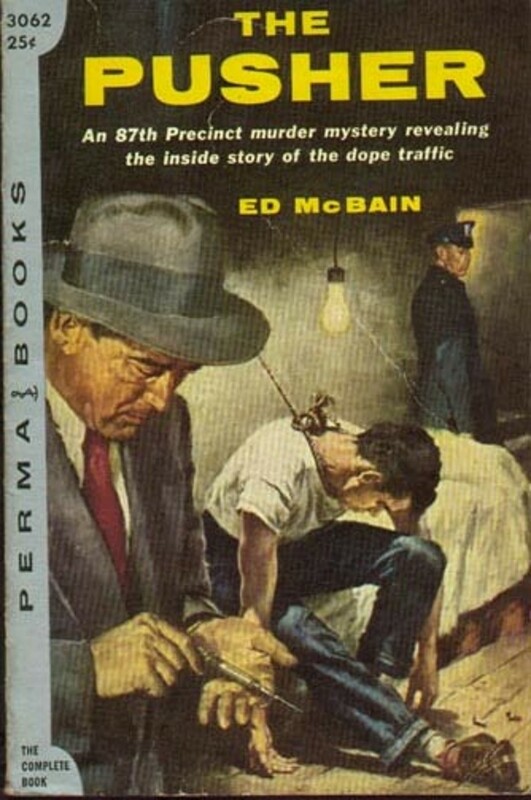 Also included in this book are two autobiographical essays by Bishop about his first interrogation and his last arrest before retiring from the LAPD, and they're worth the price of the book by themselves. You won't go wrong with this one. It gets my highest recommendation. 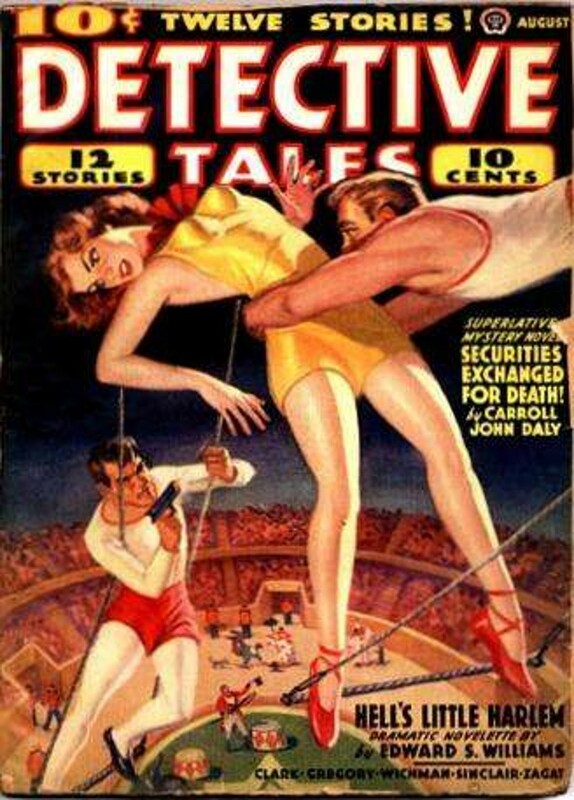 I think this may be the first trapeze shootout I've ever seen on a pulp cover. Seems pretty dramatic. 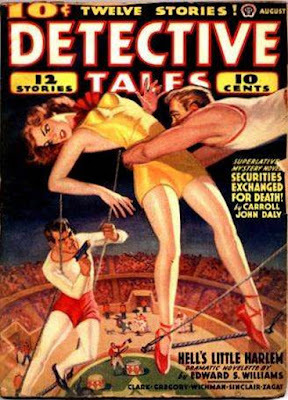 Inside this issue of DETECTIVE TALES you've got a Satan Hall story by Carroll John Daly, plus yarns by Arthur Leo Zagat, Philip Ketchum, Dale Clark, and more. Other times, other places, other stories than the ones we know...These are the Tales From the Otherverse, where anything is possible and things never work out quite the way you'd expect. 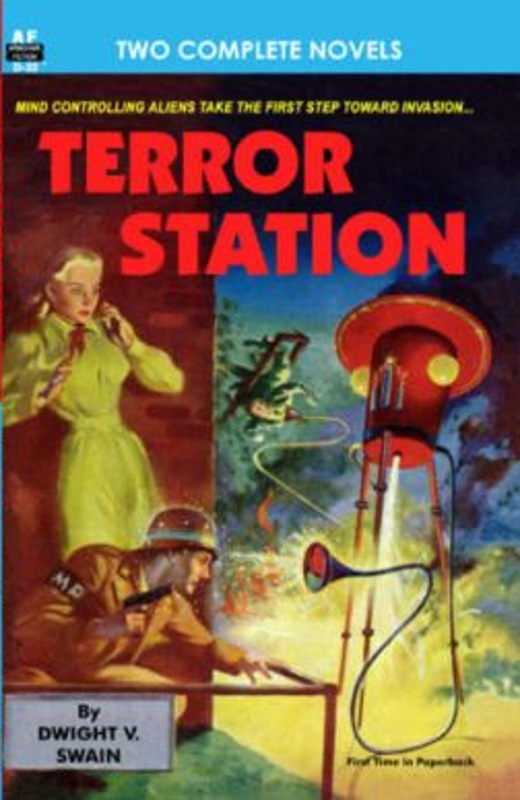 Some of today's top talents in popular fiction turn their hands to tales of alternate history. Featuring new stories by bestselling, award-winning authors Bill Crider, Lou Antonelli, Scott A. Cupp, Robert E. Vardeman, James Reasoner, and more. 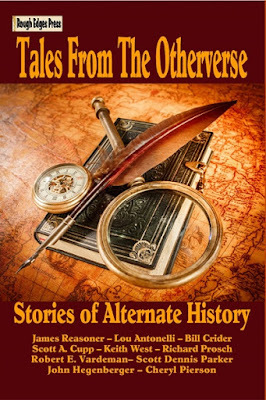 Explore the Otherverse and see what might have been! 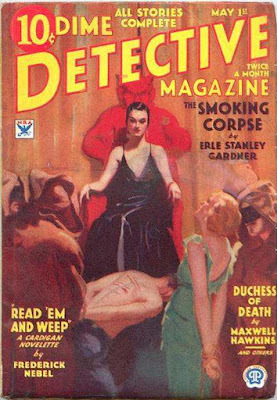 Now that's a cover! 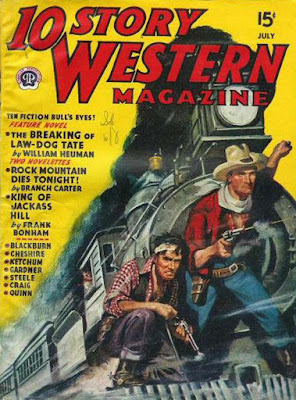 Two tough hombres riding the cowcatcher of a locomotive barreling down the tracks! From the looks of it, they're having a shootout with the bad guys, too. I've got to write a scene with a setup like this in it. 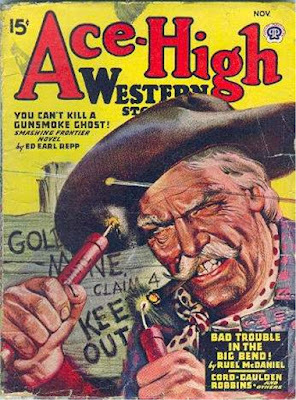 What's inside this issue of 10 STORY WESTERN looks good, too, with stories by William Heuman, Frank Bonham, Tom W. Blackburn, Gunnison Steele, Giff Cheshire, Philip Ketchum, and Barry Gardner (actually Bennie Gardner, who was also Gunnison Steele). 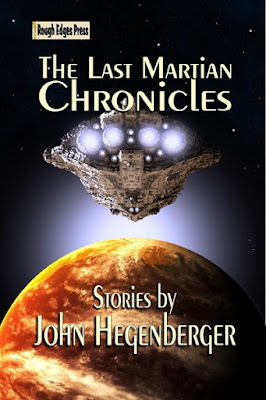 NEWS FROM FLYING W PRESS . . . .
An entire planet is about to be shutdown. Once exploited by Earth’s conglomerates for its rich oil resources, the planet Tulon has become obsolete due to the rise of alternative fuel technologies. The powers that be are ready to pull the plug. Chaos rules as Nomad gangs terrorize what’s left of Tulon’s cities. Jack Brand, ex-Army Ranger, semi-retired Tulon Security Officer, searches for his missing sister, Terry. His journey takes him from desert wasteland, to a domed city, through savage jungles, and down into a kingdom below the sea. Along the way he meets the unforgettable Christy Jones, but love will have to wait until Brand finds his sister, and soon the last ship will leave for Earth. The new edition includes an introduction by Ray Gun Revival Overlord, Johne Cook, and a bonus story from Whalen’s This Ray Gun for Hire series. Don’t miss this exciting space western adventure, which some have said combines the Space Opera thrills of Flash Gordon and the gritty feeling of a Sam Peckinpah western. 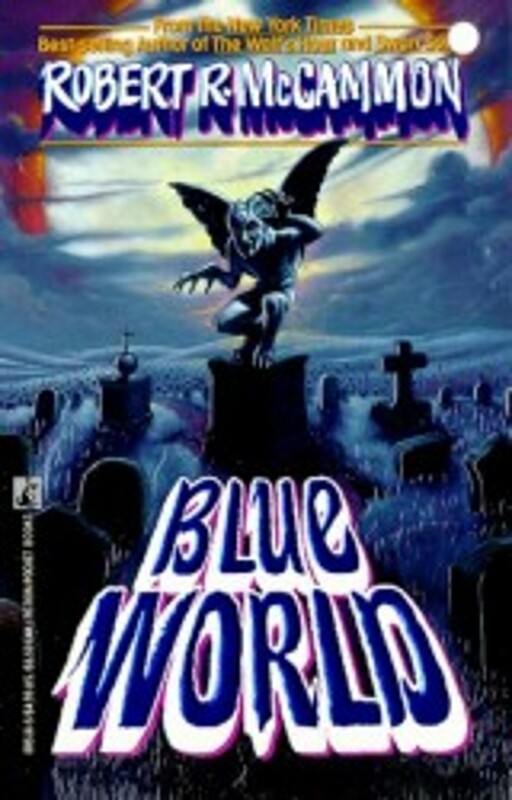 Available now on Amazon.com in paperback or Kindle. As far as I recall, I've read only two books by Lionel White before now. Liked one quite a bit, didn't care for the other one. 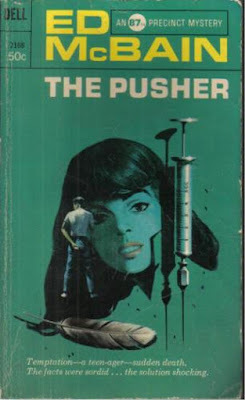 But MARILYN K., originally published by Monarch Books in 1960, is a good yarn, no doubt about that. The set-up is pure noir. Narrator/protagonist Sam Russell, ex-Marine, ex-casino croupier who lost his job in Havana when Castro took over, is driving from Florida to New York when he comes across a beautiful girl stranded on an isolated stretch of road in Maryland. She needs help, and she's attractive enough that Sam wants to help her. The fact that she has a suitcase full of money with her is an added inducement. But the situation is complicated by a wrecked car nearby with a dead mobster in it, and once Sam finds out what's going on, he's is smart enough to know that what he ought to do is just keep driving. But of course, he doesn't. He tries to help the girl and finds himself up to his neck in a mess involving mob money, murder, brutal cops, ambitious politicians, and more than one beautiful young woman who may or may not be trustworthy. White handles all this in highly entertaining fashion, juggling the elements of his plot so that the reader really doesn't know what to expect next. 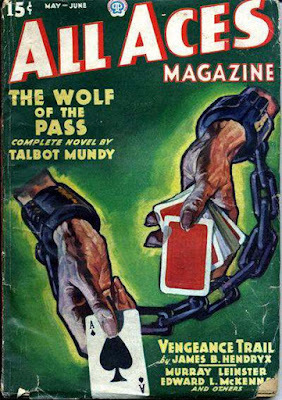 It helps that much of the action takes place around a couple of motels (that staple of noir fiction), one a ritzy motor lodge, the other a set of rundown tourist cabins. It all leads to a satisfying, if somewhat predictable, climax. 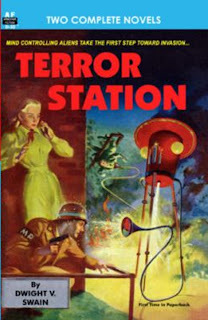 MARILYN K. generates a considerable amount of suspense and hardboiled thrills, and it's good enough to make me want to read more by Lionel White. Luckily, it's being reprinted this month by Stark House in a double volume with THE HOUSE NEXT DOOR, and it's available for pre-order. Well worth reading is my verdict. 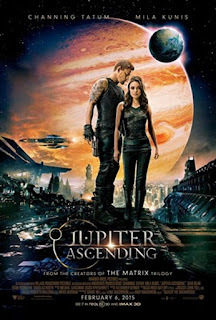 JUPITER ASCENDING is another movie that got mostly bad reviews, and if you're a regular reader of this blog, you know that means there's a pretty good chance I liked it. And so I did. So, lots of stuff blows up real good. Tatum zips around like the Silver Surfer, only instead of a cosmic surfboard he has flying boots. Kunis dresses up like a space empress. The great Sean Bean is Tatum's tough, grizzled old mentor. The villains are thoroughly despicable. Spaceships dart around through wormholes. Planets explode (speaking of stuff blowing up real good). What's not to like? This ain't cinema, folks. 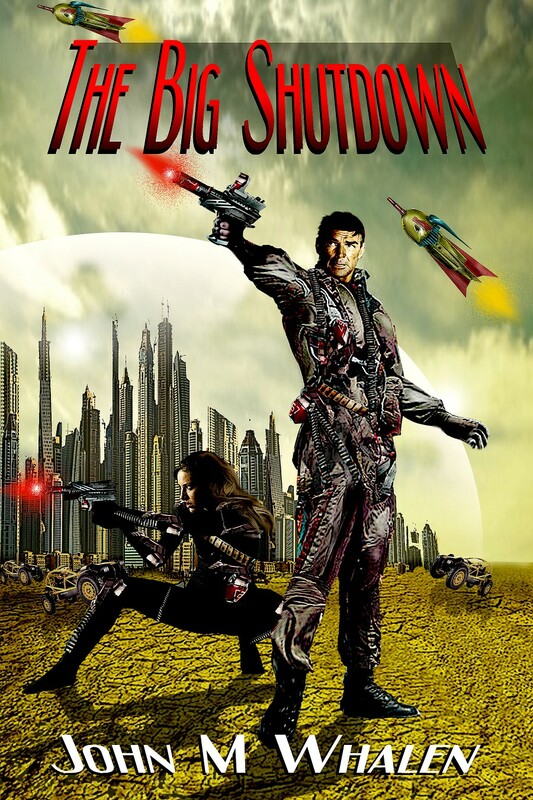 It's a flashy, over-the-top space opera, and I had a grand time watching it. It was made by the Wachowski siblings, and honestly, I liked it considerably better than either of the Matrix sequels. 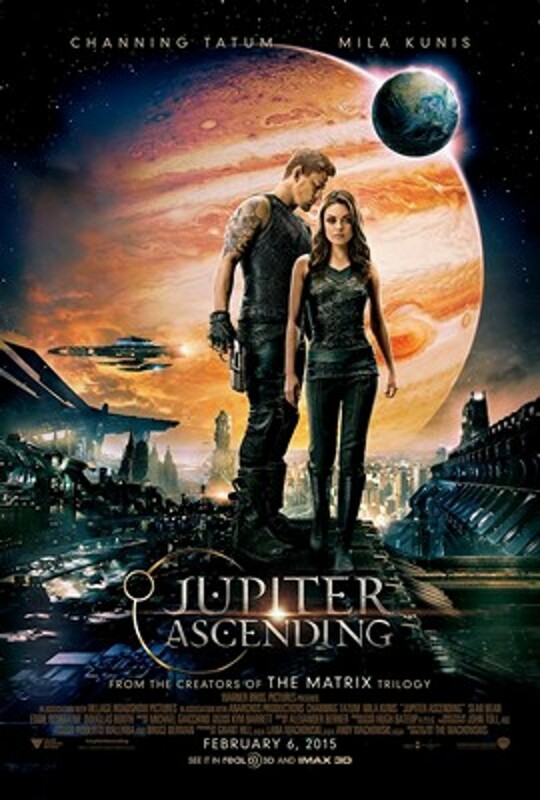 As always with movies like this, I expect to be in the minority, but I think JUPITER ASCENDING is pretty darned good. It was the biggest endurance race the West had ever seen—hundreds of miles across grueling territory, with a fortune riding on the outcome. Kate and J.D. Blaze, the West's only team of husband-and-wife gunfighters, are hired to make sure no one cheats and that riders and horses are safe, but before the race even begins, trouble crops up. Greed, old hatreds, and sudden death are riding in this race, and Kate and J.D. will need all their cunning and gun skill to keep murder from winning! 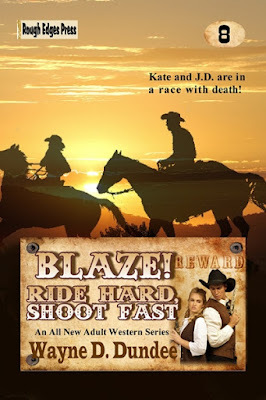 Best-selling, award-winning Western author Wayne D. Dundee returns to the BLAZE! series with another fast-paced entry full of hardboiled action, compelling characters, and plot twists. Read RIDE HARD, SHOOT FAST and find out why BLAZE! is today's top Adult Western series! A short-lived pulp from Popular Publications, ALL ACES certainly had some good authors writing for it in this issue: Talbot Mundy, Murray Leinster, James B. Hendryx, and Dale Clark, along with a few others not familiar to me. That's not a particularly attractive cover, but I'll bet the stories are entertaining.